A new Met Office report says the UK has experienced more weather extremes over the last 10 years when compared to previous decades. The report says nothing of the sort, and certainly does not support the BBC’s disgraceful attempt to link it to drought, as it actually says the opposite. 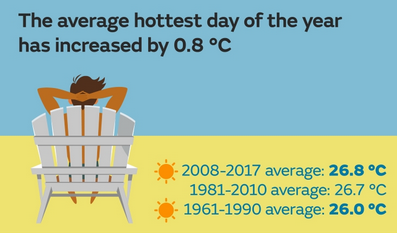 The hottest days each year are not getting hotter. 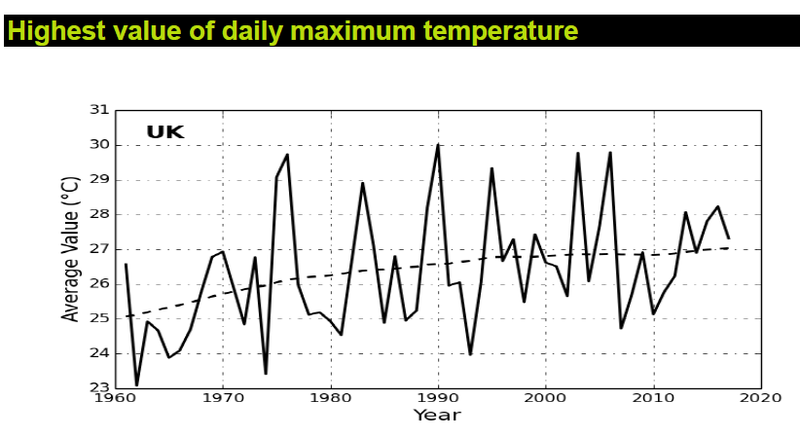 The chart below is from the new Met Office report, and shows daily maximum temperatures in the last decade have got nowhere near those of 1975, 1976, 1990, 1995, 2003 and 2006. According to the report, the average in the last decade has dropped to 5.3 days, from the 1981-2010 average of 6.4. The convention of using the most recent three decades as the climatic norm is well established, so why does the Met Office persist in using 1961-90 as its standard reference period? In fact, they are so rare that they barely exist at all outside of the heavily urbanised areas of London and the West Midlands, where night temperatures are affected by UHI. Even then the incidence is about one night per decade. The numbers are so sparse as to be meaningless statistically. 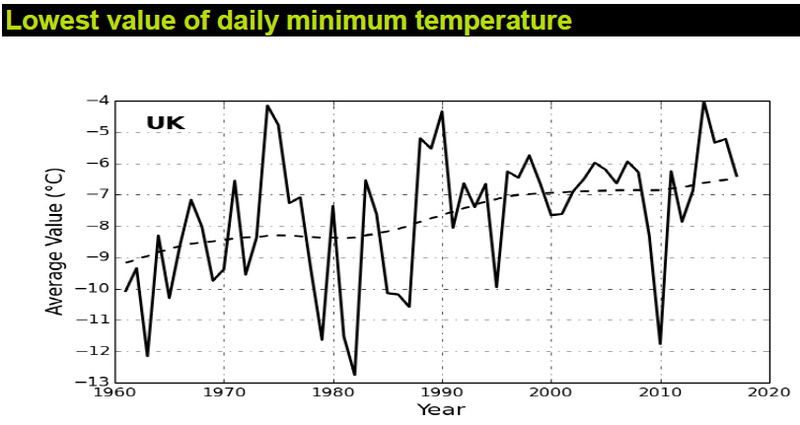 As if to emphasise this point, the highest recorded daily minimums on CET were 18.8C, set in 1948 and again in 1997. In short, these are simply extremely rare and random weather events. 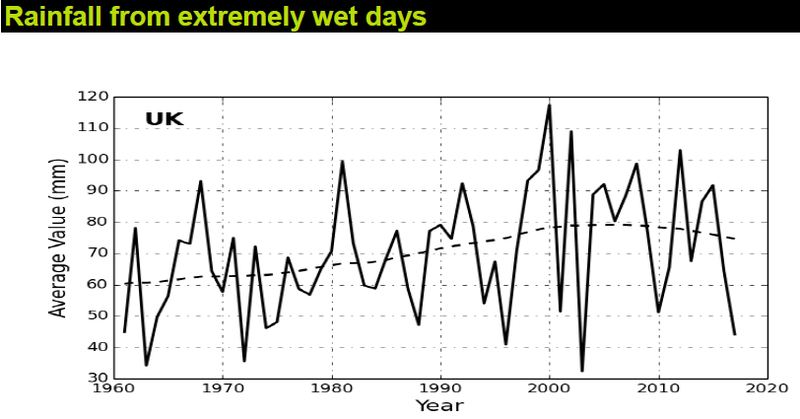 The report appears to show that total rainfall from the wettest days, (>99th percentile), has increased since the 1960s. However, the period from the 1960s to 90s is well known by scientists to have been a “flood poor period”, so drawing conclusions from such a short period is dangerous. The Met Office’s own report admits that this is the case, when discussing dry spells. It is not clear why the Met Office chose to begin their rainfall analyses in 1960, and not an earlier period which would have yielded more meaningful results. ← OBR Forecast Fuel Duties To Continue To Rise–So Where Are All These EVs? The Title is totally misleading. In fact there has been a REDUCTION in the cold extremes, greater than the RISE in warm extremes. Surely a good thing? All consistent with the natural post glacial temperature adjustment of some ? (sorry I have forgotten the figure) about 1 degree over the period. Meanwhile without the presentation hype this was a non story. I had to switch the BBC off on this to ease my blood pressure. What you said is so true. People should actually turn off a lot of news. I hear that being advocated by some here. I rid my home of TV in early 2013 and do not have any regrets. I did not grow up with it as my parents were not great fans. In fact is was in college before we had one. I am fortunate here, to have 3 hours of conservative treasure Rush Limbaugh on the radio from 12:00-3:00 pm. As a 24/7 subscriber, I can also listen to his show archived on the day or later on my phone or computer. Since 1992, Rush has kept me back from the ledge. He gives the liberal side of things, quoting from what they say and write, in order to “nuke” it. Instead of having the news sliced and diced, I watch things on my laptop. For example, I watch President Trump’s rallies either streaming or “full speech” versions. I also watch his talks at the White House and some of the cabinet meetings. The bottom line is that I cut out the media’s “take” on it–they are 92% negative towards President Trump. Surely there should be an anti-torturing campaign on behalf of the statistics? Have they no rights? Because it is guaranteed to give them the anomalies they seek, as it had some of the coldest temperatures of the 20th century. I enjoyed listening to John Humphreys on Today, this morning, struggling to understand what the guy from the Met Office was telling him. It was something to do with getting data to back up the extreme weather we have been having. Humphreys wanted to know more about what he would do then. Do? That was below the belt. Well, he was in the process of getting this data, but when he had it we would all be better off because we would then have the data on the extreme weather rather than not yet have it. Then, at the lunch time news, the BBC spoke to three different experts with more or less the same impressive non-results. Mrs Cat was mystified. All this talk about floods and her garden hardly saw any rain. They were also heavily plugging ‘the oceans sucked up more heat than our worst nightmare’ report. At no time did they explain that the writers of said report decided actual temperature data was not good enough, so used proxies – so in reality it’s a rough guess. But this irrefutably proves that the earth’s climate is far more sensitive to CO2 than we previously though, apparently. Of course Channel 4 was as bad as the BBC at trying to spread alarm where none exists. Up to about 1995-2000, most max and mins recorded were recorded by constricted mercury thermometers before they were replaced by electronic. They are by nature less sensitive, so absolute maximums and minimums are always going to be more extreme in the last 20 years. Could electronic thermometers also be more sensitive to the influence of the sun on the Stevenson Screen, (assuming the are within a Stevenson Screen) ? The idiots continue on their lemming-like rush to nowhere – this sort of thing is just their version of a “Colonel Bogey” marching song. UAH “brightness temperature” for October up slightly. Perhaps there is a need to question seriously the WMO definition of 30 years as climate characterisation as it is clear that the main climatic cycle is 60 – 70 years. Given that the temperature time curve is a sinusoidal curve, even though not quite exact in period, taking 50% of the curve provides misleading conclusions depending on which part of the cycle the analysis uses. Taking the period from the low of the last cycle (late 1960s), when we all thought that global cooling and ice-ages were coming, guarantees a rising trend. However, modern spreadsheets in the hands of the “statistical torturers” mentioned earlier, are allowing a new dimension in tormented statistical analysis of fundamentally inaccurate data. It certainly appears that either the authors are incompetent or deliberately misleading for political purposes: surely they are not incompetent??? I seem to recall Richard Lindzen stating that the quality of “scientists” in the field of “climate science” was very poor, because it was so easy to get funding. The best and most competent scientists would go into far more interesting fields of study. Ay, there’s the rub. How often in life does one stand mouth agape and say “It is not possible for a human being to be that stupid, is it?” My provisional thought is that it is possible but only by hitting oneself with the ‘stupid stick’ for a really long time. “Extreme” weather should include sunshine hours, which would reveal the close link between heatwaves and those awful extended periods of sunshine. Another vital weather extreme is now LOW wind conditions, especially in winter, when one of the Met Office approved methods of electricity generation will fail. A campaign to get them to provide low wind warnings would be fun! Good old Samuel Pepys. He always ruins the climate alarmist party by putting the ‘precedent’ into unprecedented! If you happened to have been born in England circa 1645 and lived for 60 years, you would have seen more weather extremes than even the febrile imagination of Michael Mann could conjure up in his worst doomsday man made global warming scenario. Prolonged droughts, plagues, flooding and crop failures, cities across Europe burnt to the ground, glacial cold and prolonged frigid winters and, to round it off, the Great Storm of 1703, the like of which we’ve been fortunate enough not to see since. And what were Co2 levels, the so called control knob of the climate, doing then? Not a lot and almost a third lower than they are today. Any lower, and mankind really would have been in trouble. And right on climate scientists see such pre-industrial levels of Co2 as ideal. Really? Really? Hats off to the quintessential diarist. I met Mr. Pepys in high school and was reacquainted with the gentleman during my freshman year at WVU in Humanities class during which we read a lot of those being studied. I spent a lot of my freshman year in the “Reserve Room” of the WVU Library. Who would have thought he is prescient today? Perhaps the BBC will have to do some “hit pieces” on Pepys–delve into his past, search for evidence of racist thoughts, etc. Totally confused now! all those “sound bites” from the MSM – ‘a mean tae say’ – I’ve given up on listening closely to the news on whatever channel – even FOREIGN Progs in other languages – you become aware of the Term -“Clima…” or “Warm….” coming into the conversations. ALL that I DO KNOW is that in the N of Scotland ( A Region or Are / Part of the UK, before the Politico Elite bastardised words and made it Highland Region, etc) so that now outsiders thing we must be an island community in the Norwegian Sea or summat, ), I has been a COLD summer – had a warm spell late in spring which helped all the outdoor grapes to flower , late after a late spring, and set fruit – only never to mature – like the apples still hard and unripe. Likewise maincrop plums. For Agric crops weather was OK but suffered somewhat from lack of rain IF they were planted too late or with insufficient NITROGEN to boost early root development – Light grain weights…. Early Frost this back end and then the winds, threshed n trashed a lot of plants leading to premature die-back.. So you wonder why those of us working with Nature completely disagree with all this stupidness… Ask yourselves the Question.. “Whose Country is this ? – the Land of the rural fowk or the Metropolitan MSM Politico ELite etc – and then where is this country heading.. – Food sustainability, etc jobs for the future etc. ” I think Capn Mainwaring was told the correct Answer way back then – but we laughed. Fooked! Agriculture is usually dismissed by the “experts” because it is only a tiny part of GDP. Yeah right, try running an economy consisting only of the majority of GDP, such as NHS/education and hairdressers, and you will realise that GDP is poor at capturing what really matters. Correct. GDP is a useless and deceitful measure. It measures transactions (churn) and has nothing to do with Production or product. If i sell you my hat for £1 then GDP rises by £1. Then you sell that hat to Jim for £1 and GDP rises another £1. Jim sells the hat back to me and GDP rises by another £1. So our little ‘activity’ has raised GDP by £3 but at the end of it there is still only one hat and i still have it. Nothing has been created, no product produced. 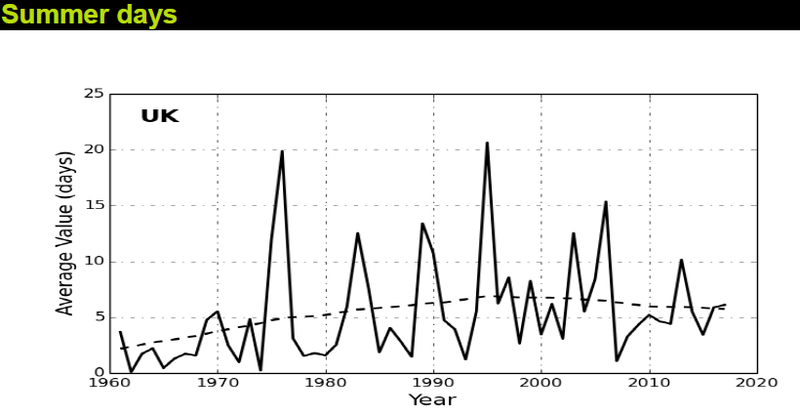 The Met Office HadCET temperature anomaly series relative to the 1961-1990 average shows the latest anomaly to be about +1ºC. However the UAH satellite temperature anomaly series relative to the 1981-2010 average shows the latest anomaly to be about +0.2ºC. No wonder climate alarmists shun the untarnished satellite data. 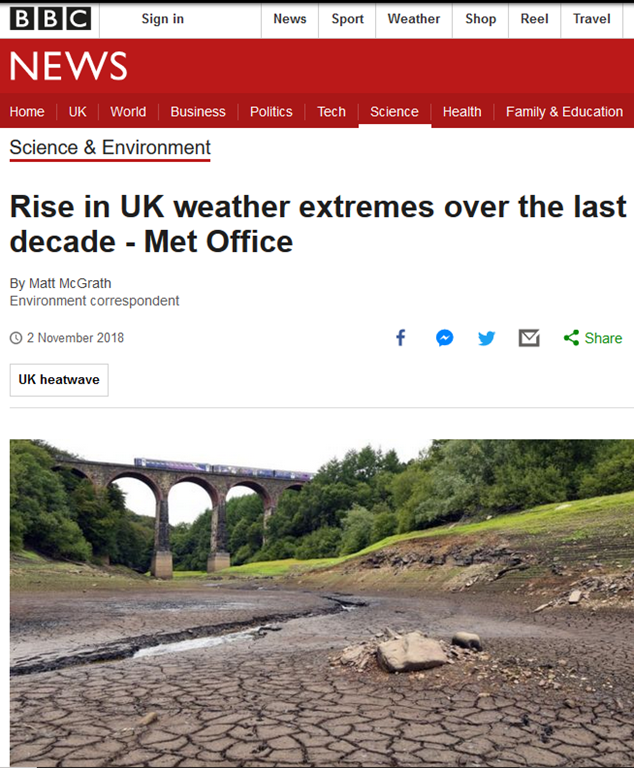 It is good to see that both in the BBC report and in the Met Office that reference was given to the fact that the rainfall extremes are due mostly to natural variation rather than climate change (this should be quoted in the future). That does not, however, excuse either from their bias to temperature extremes. It is pretty obvious that if temperatures have risen in general, then the maximum extremes will be greater and the minimum extremes less. Overall, therefore, one balances out the other. It must be illogical therefore to quote that the weather has become more extreme. It has not. As others are saying, the change in climate in the UK has been overall beneficial rather than detrimental. One other point, the Met. Office do actually give a comparison of the last decade to the last 30 years, although this has been rather down-played as the differences are significantly less than with the earlier period. As Paul has mentioned in other posts, the climate has changed little over the last 20 years, and if a comparison was made between 1998/2007 and 2008/2017 then I feel confident that these figures would show little if any difference. No wonder than that this comparison was not made. On the subject of why such a report is made, I can only agree. Just looking at the average rainfall where I live over the last 12 months shows only a normal amount. It completely disguises the fact that last winter was the wettest on my records, and was followed by one of our dryest summers. Our harvests reflected these extremes. This was also reported on Sky news who were no better than BBC in their coverage of it. They even drafted in the weather girl (Naz) who simply repeated the MetO/BBC headlines. They didn’t bother to dig deeper into the report to explain what the figures meant or apply any investigative skills. Also it seems to me that there is a reasonably clear natural cooling/warming cycle in UK climate (maybe global but I’ve not looked closely at global data). We swing between warming and cooling every 30 years or so, so 60 years for a full cycle. It is therefore quite important when comparing data to use periods that lie in the same approx. position within those cycles eg. If the current cooling cycle started in for example 2004 then surely we should be comparing 2004-2014 to 1944-1954 or 2007-2017 to 1947-1957? If we don’t do this then we are not comparing like for like as we’ll be comparing a naturally warmer part of the cycle to a naturally cooler. However I’m just a layman so what do I know? 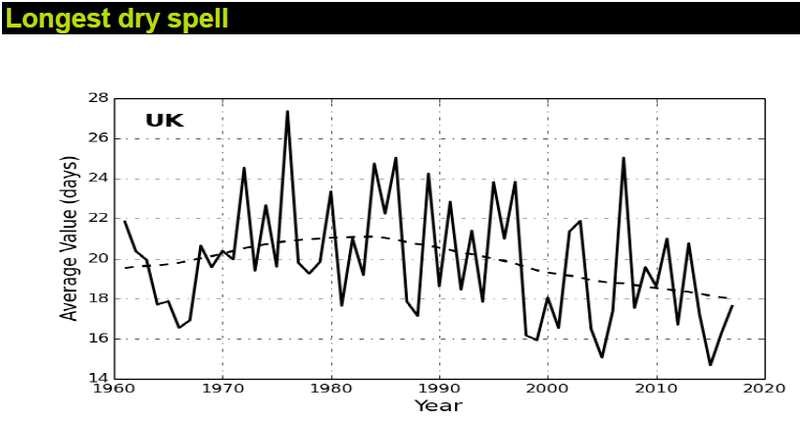 I’m old enough to have been born in the 60’s and grown up in the 70’s so I don’t need to rely on MetO data to tell me that winters were colder back then than now, on the face of it that would support the global warming argument. However summers were warmer and longer back then than now. My experience of the past 20 years is that we’ve had milder winters and dreary wetter summers than when I was young. This year has been the exception for long warm spells not the norm. My personal opinion is that we are now in a natural cooling cycle. If we don’t see this confirmed in observed data then it would suggest to me that we genuinely do have some warming going on. What percentage of that warming is man made is the big question. I think there can be little doubt that we are having some impact, after all, UHI effect on temperatures is itself a sign that human activity is having an effect albeit confined to areas of major industry/dense population. I do doubt though that we are affecting global temps as much as is claimed by the AGW folks. In many ways their exaggeration has done them no favours as they have cried wolf for far too many years now. The public has lost all interest. If this current cooling cycle actually leads to colder winters then we may even see large scale protests and calls for governments and agencies to abandon their war on fossil fuel. This year so far is proving to be much colder than any previous year in the 16 years we’ve lived in this house. Winter lasted almost to summer (we didn’t really have a spring) and then it got really cold here in September and we had to put our heating on at the earliest date for 16 years. It has also been pretty cold the last few weeks, certainly cooler than most Octobers over last 16 years. Mud4fun – small correction to your post required – done below. Hi bobn, I disagree. UHI is perfectly measurable and significant. I have personally verified this by measuring temps at home on my weather station in my very rural location and in local market towns and at MetO weather stations. In winter the local market town is consistently 2-3c warmer than our rural location. 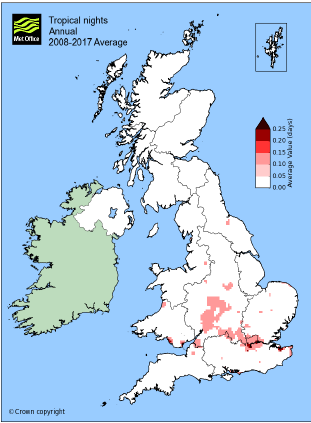 In one extreme case, our home weather station recorded -19c in January 2010, the MetOffice showed a minimum of just -12c for our area on their database for that same evening. That is a significant variance! The majority of the local weather stations that feed into the MetO database are located in towns or on housing or industrial estates and suffer from UHI inflated temps. I dare say a city would show an even greater variance than our small local market town. For the very localised climate in those urban areas there is clearly a measurable impact from waste heat. In summer there is very little difference between our weather station and the official MetO figures for our area. In fact several days this summer we recorded marginally higher temps than the MO. However I doubt these UHI’s have much impact on a global scale because only a tiny percentage of the earths surface is urban/city sprawl. The biggest impact they seem to have is with the ‘official’ data sets because the MetO are using data from sites they know to be in UHI locations. I don’t doubt your temperature comparisons, even though they conflict with my own. I am of the opinion that the UHI effect is more noticeable in summer than in winter. I read that there is a difference in UHI between urban areas, partly due to the how the urban area is built up and partly because of the difference in the rural habitat (extremes being desert against woodland). Could this possibly be why your area is different to mine? Is there a possibility to share your data? The intervals overlap and 13 y are double counted. Is this standard practice? Note that the current (incomplete) decade is below that of 1941-1950. So what is the difference between “extreme weather and climate events”??? “There is a preference in the atmospheric observations chapter of IPCC AR4 to stay with the 1961-1990 normals. There is some discussion of going to 1981-2000 to help the modelling chapters. If we do this it will be a bit of a bodge as it will be hard to do things properly for the surface temp and precip as we’d lose loads of stations with long records that would then have incomplete normals. If we do we will likely achieve it by rezeroing series and maps in an ad hoc way. There won’t be any move by IPCC to go for 1971-2000, as it won’t help with satellite series or the models. 1981-2000 helps with MSU series and the much better Reanalyses and also globally-complete SST. 20 years (1981-2000) isn’t 30 years, but the rationale for 30 years isn’t that compelling. The original argument was for 35 years around 1900 because Bruckner found 35 cycles in some west Russian lakes (hence periods like 1881-1915). This went to 30 as it easier to compute. The statistics produced by the MO, would leave the layman under the impression that before 1961 temperatures were even lower, which they were not. In fact the decade 1961-70 was the coldest in the entire series. I suspect that is why the MO used that as their starting point. Weather is not more extreme—the news is. The BBC’s news bulletin headlines also quoted the Met Office report as being further evidence of ‘man-made’ global warming. I can’t see any reference to man-made global warming in the report – or have I missed it? It’s an INSULT to the general population. I am glad day after day that I chucked out the telly. I clearly remember the nice hot summers of my childhood and the lovely deep snow in the winter. I read today that now, the same people who say that cow farts cause global warming are saying that dogs and cats do the same. We are about to be discouraged from having anything bigger than a budgie. How long will it be before wildlife becomes the “threat”? Curiously, nobody seems to have mentioned the amusing thing with the MO using the 1961-1990 period. I don’t have the exact figures but I’m pretty certain that the UK had vastly more heavy industry in the 60’s and 70’s than compared to the last decade. All those coal mines, coal power stations, steelworks, shipyards, car factories and other major manufacturing businesses. So in the UK we are now approaching pre-industrial levels of heavy industry!!! At the same time, the population in the UK during the 1961-90 period was at least 20% smaller than it is today? If CO2 is still rising and the UK temperatures are still rising (as claimed) then it is not industry that is the problem but rather population. The MO is basically showing that population is causing warming (albeit via UHI effect on MO temp data). The amusing thing is that the same liberal elite waging a war on fossil fuels are invariably the same people who have supported vast numbers of immigrants coming to UK which has led to at least 10 million more people living here since 1998. Those 10 million people need millions of new houses which significantly increases the waste heat contributing to either UHI or UK average temps and climate (depending on your viewpoint). They also use transport, whether that be private motor car or public transport, the bulk of it which will be using fossil fuels. So the alarmist headlines based on this report (or the recent IPCC report) can be interpreted to mean that population growth is the main issue (not heavy industry or fossil fuels) and that mass immigration should be halted and measures taken to start to reverse it. I guess it is easier for politicians to call for the destruction of the UK power supply and transport system than to suggest we stop importing more people?